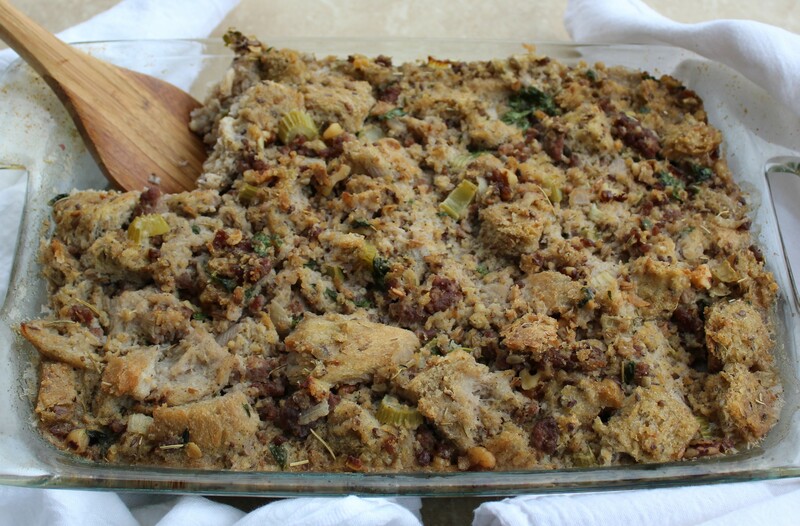 Today I have a recipe that’s going to up the cozy factor in your life. 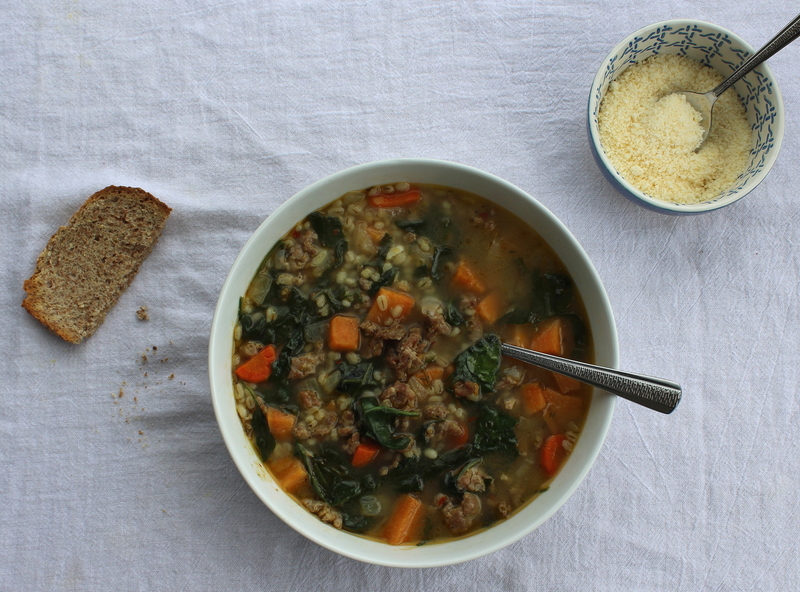 Say hello to Spicy Sausage, Barley, and Veggie Soup! February is most definitely a time for ultra coziness here in Michigan. We are deep in the throes of winter and weeks and weeks of gray and gloom, so I’ll take all of the warm-fuzzies I can get! Hello, all! How are you surviving the increasingly shorter days – you doing OK? I’m speaking to my friends in the Northern Hemisphere, of course. To our friends in the Southern Hemisphere: I hope you are enjoying your summer and all of that gorgeous, brilliant, abundant sunlight! Wave hello to the beach for me. I, for one, am NOT a fan of the darkness that rules this time of year. If I let it, it will bum me out. Because of this, I’ve been determined since the end of Daylight Savings time to embrace any positive aspects of the longer and longer nights that I can find. Darkness is . . . cozy. It gives me an excuse to burn candles for hours on end. It gets me to bed earlier, because it feels like stark midnight at six p.m. Looking on the bright side! And during days when I can’t summon a rosy sentiment about the weakening sunlight, I am hell-bent on wholly distracting myself from it. One majorly reliable way I do that? Making and eating good food, of course! 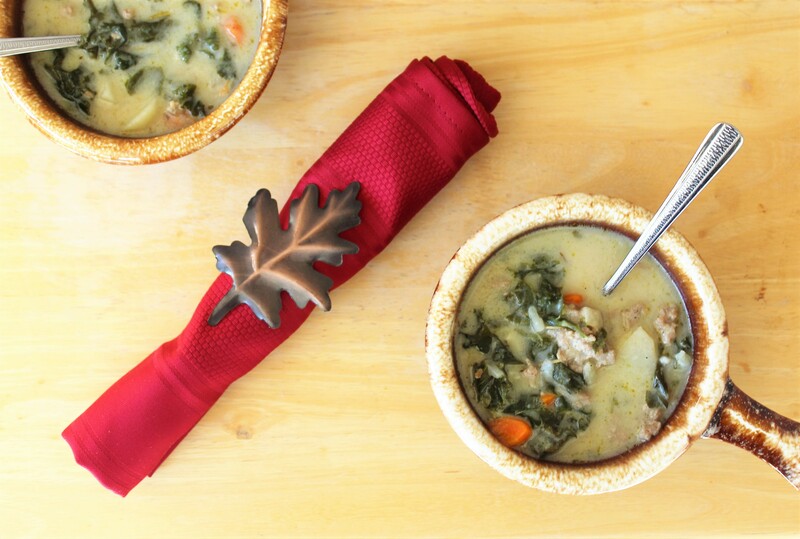 And this Creamy Sausage, Potato, and Kale Soup is pretty darn good, I must say. It’s getting warmer, you guys! Spring has arrived to the Northern Hemisphere! Huzzah! Here in Southeast Michigan, the early days of spring can often feel like what I’ve termed “Winter Lite.” Consistently warmer weather can take a while to get here; snow – at least a few whimpering, amount-to-nothing flakes – can be expected as far into spring as the end of April. 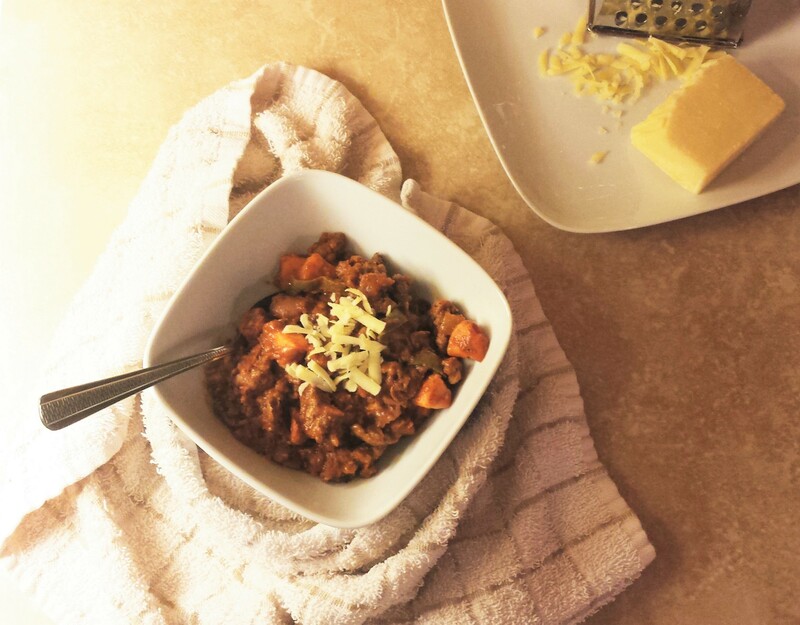 So hearty meals such as this spicy sausage and sweet potato chili are still on the agenda for me. It’s bowl game season! The Big Game is only a little over a week away! Confession: I could give a crap. I’m not a football gal (too long and tedious to me – I can’t get into all of the starts and stops). If my hometown Lions made it all the way, I would be ecstatic for my family, who have stood by them for decades, through all the disappointments, mediocrity, and downright atrociousness. But since they made it nowhere near the Big Game this year, I don’t have a ton of interest in it. I’ll be rooting for Denver, because I have family out there who roots for the Broncos (Hi, Aunt Ria!). The only reason I do care a little that the Big Game is coming up (I keep saying “Big Game” because I think none of us is really supposed to say “Super Bowl,” right? I find that utterly ridiculous.) is for game-time snacks! I love game-time snacks! 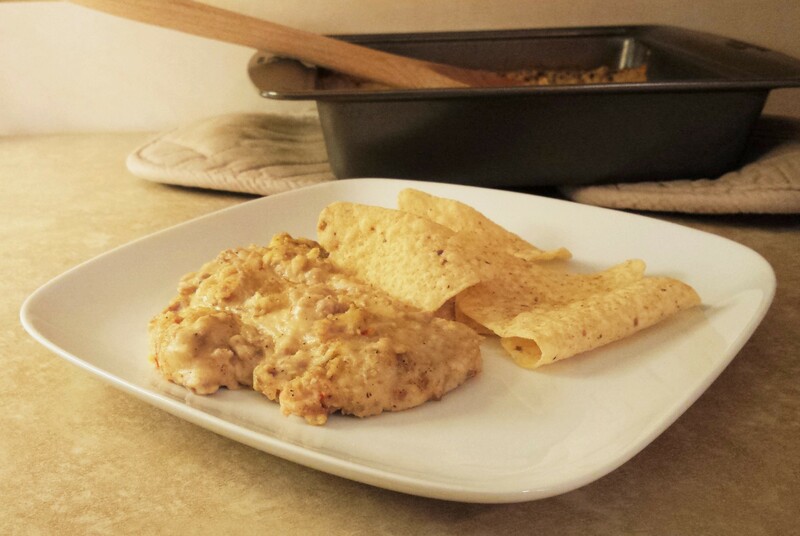 And this dip is everything you want in a game-time snack: rich and cheesy and spicy and fatty and probably not all that good for you. 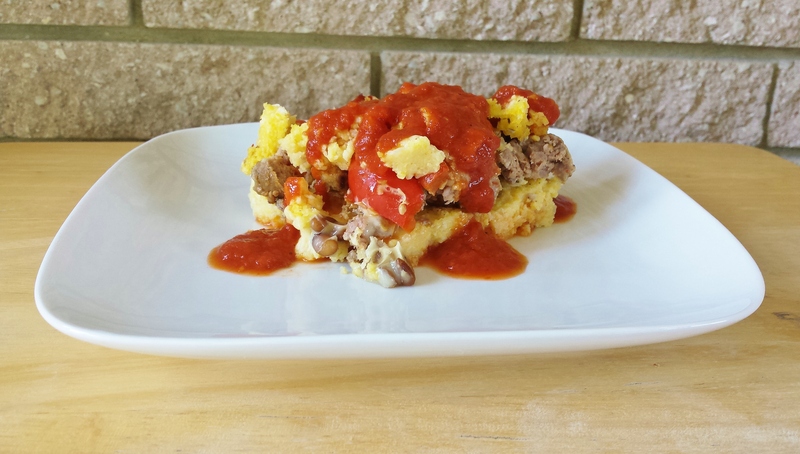 Polenta always reminds me of my Croatian grandfather because he ate it all the time – topped with rabbit stew or something else of old-country ilk. I wonder if he would’ve liked this sausage and red bell pepper casserole? 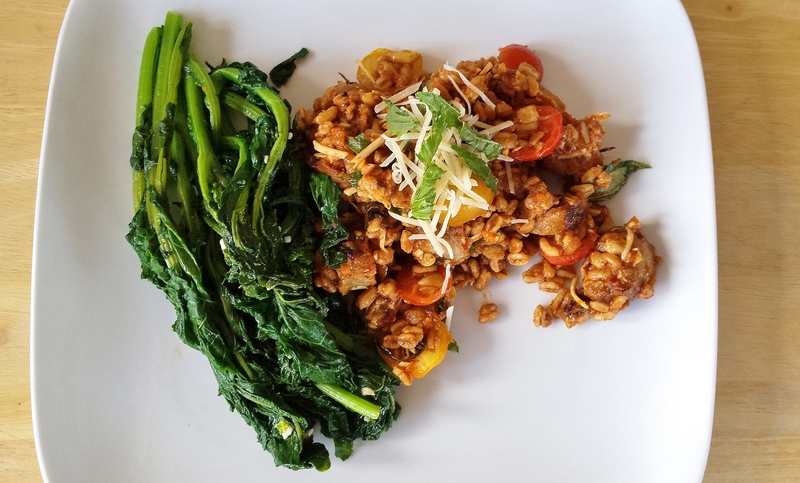 After creating my Pine Nut and Parsley Pesto with Grape Tomatoes and Italian Farro recipe a few weeks ago, I was anxious to create another dish using this chewy, pasta-like grain. I also had just picked up a few cartons of some lovely grape tomatoes at my favorite Italian market and was really, really excited to use them (tomato season is here again – yay!). 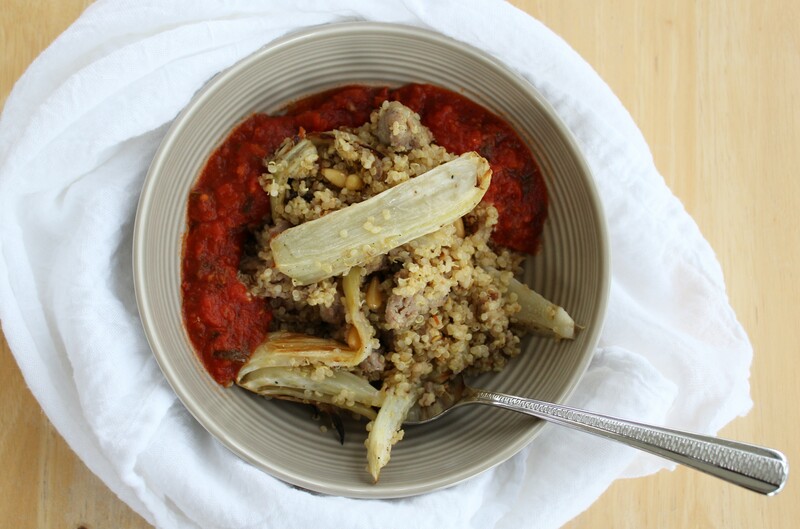 So I created this Italian Farro with Sausage, Grape Tomatoes, and Pine Nuts recipe.